Mayor Mufi Hannemann addressed backers at his Dole Cannery Square headquarters last night after the third printout, which showed he fell short of an outright win. 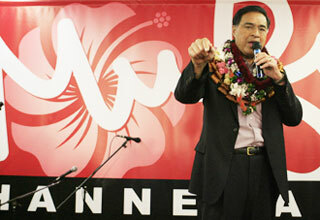 He faces Councilwoman Ann Kobayashi in a Nov. 4 runoff. Leaders on the international textile arts scene,turned their discerning eyes to "Fiber Hawaii 2008"